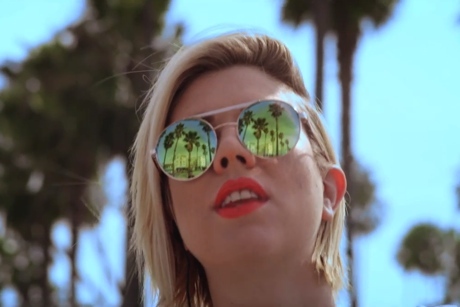 EMA's music is frequently dark and noisy, but her new video for "So Blonde" finds the experimental songwriter soaking up the sunshine on the beach. The song touches on the heavy side of folk rock, as acoustic strums are backed by hard-hitting drums and some grunge-y growls from singer Erika M. Anderson. The accompanying video, directed by Vice Cooler, shows Anderson hanging out by a skate park on the beach and cruising around in a convertible. The slickness of these shots is undercut by corny CGI graphics and occasional views of the camera crew reflected in the vocalist's sunglasses. EMA's The Future's Void LP will be out on April 8 through Matador.